7. John T. Renz, M.D. 8. Thomas G. Loflin, M.D. 9. Robert J. Stanley, M.D. 13. Emmett O. Templeton, M.D. 15. Thomas A. Gibson, M.D. 17. Constantine D. Morros, M.D. 18. H. Cotton Ray, M.D. 21. Robert T. Ryan, M.D. 24. Bill V. Hewett, M.D. 25. John G. Kimbrough, M.D. 26. Lawrence E. Fetterman, M.D. 27. Edgar W. Branyon, M.D. 28. Lowry R. Young, Jr., M.D. 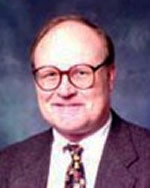 Lowry R. Young, Jr., M.D. 29. William V. Weldon, M.D.